Congratulations to Josh Cooper, the Forest of Dean Gymnastic Club's top gymnast, who came 12th in the 2016 English Championships. Josh also came 21st in the Junior British Championships a week later. Josh also competed in Geneva in Switzerland at the end of April. Eight members of the Forest of Dean Gymnastics Club have been selected for the 2018 Gloucestershire Gymnastics County Squad.Huge congratulations!! Anastasia Hughes, Lola Newman, Florence Eaton, Emily Holmes and Violet Williams were selected at a County trial and Eden Addis, Amelia Seal and Charlotte Cotterell were selected from their results at the 2017 County Championships. They will now attend three County training days with the County's top coaches. With darker nights it is easy to just close the door & sit in the armchair when you get home. Guaranteed you will pile on the pounds and feel sluggish. You can change all that by coming to Fitzoneto have a workout or join a Spin class, Boxfit, YogaMix or Circuit class. Don't let fitness be boring, think of it as an 'Investment in your health'.Don't wait to feel unfit, keep active and joints and muscles supple by doing gentle, regular workouts. You will make new friends too. 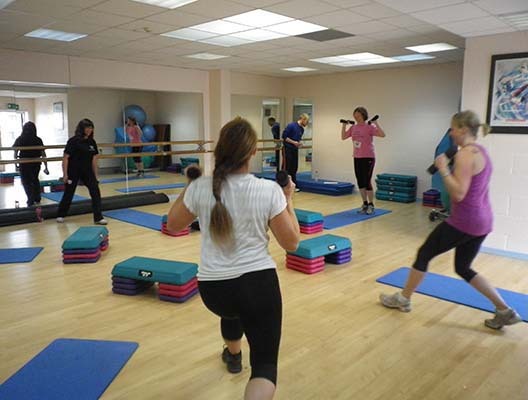 If you want to tone up or lose weight do it with our help here at FITZONE. We provide the motivation too. No matter what your age, whether you're a Young Mum wanting to lose post - baby flab, a 40 something wanting a Gentle Tone Up or if you're a Fitness Junkie wanting a Challenge, just come and tell us how we can help you. Classes are small so Ring Now to see how we can help you. Forest gymnasts, parents, fitness members, staff & coaches proved their fitness when they took part in the Royal Forest of Dean Rotary Club 5K as part of'TEAM BRY' to raise funds for 'Breast Cancer Now' in memory of Bryony Hammersley who died in June 2015. Bryony was a past gymnast & coach of the club and daughter of Lynn & Chris Hammersley. Lynn is head coach & Chris. a Trustee. Over 80 friends & family took part. On a great morning with blue skies and a cool breeze conditions were ideal and the spirit great. First Team Bry member home was Sam Cooper, gymnast & fitness member who came in, in 3rd place in a brilliant time of 19.17mins. William Bees was just behind in 8th place in 21.54 & Josh Cooper, 10th in 22.44. Ryan Shinners came 24th with 26.42 just ahead of Pre - school coaches Joy Gulliver-Brown & Nicky Tweed. The boys' coach Vlad Schegolev & wife Olga also ran along with junior squad member, Maisie Edwards who ran with her mum, paramedic, Laura. Maisie was 91st in 37.51. Mel Cooper, fitness member and mum of Sam & Josh, came 28th in 31.22 & Rachel Perkins 31.41. Club receptionist, Jeanette Knight ran with daughter Lucyna (ex- coach) in 58.15 & 58 minutes. Lynn finished in 40.21 with Bryony's dog, Poppy, who had several loo and sniff stops on the way!